Coppermine in a 440LX motherboard. Hey guys, I feel like sharing what's been going on in my folding@home covert operations laboratory. I dug a bunch of crap out of the closet today. I managed to get enough parts together for another folding box, minus the case. Anyway, I have this old Shuttle 440LX board and a P2-333 combo. But I also have a P3-500E sitting unused. So I think to myself "Hmmm, SSE and full speed cache are probably better for folding" so I throw the 500E in an old Iwill Slocket II with the voltage on auto, and nope it wouldn't boot. Then I think to myself "wait a second you nimrod, the voltage regulator probably doesn't do 1.6V". So I locate the voltage regulator and sure enough, it doesn't support 1.6V or any .05V increments. The good news is that it does support 1.8V as it's lowest setting, which is easily tolerated by the CPU in question. So I set the slocket voltage to 1.8V and she posts! But it freezes at the attatched screen So I'm lookin' and I think to myself "duh!!! 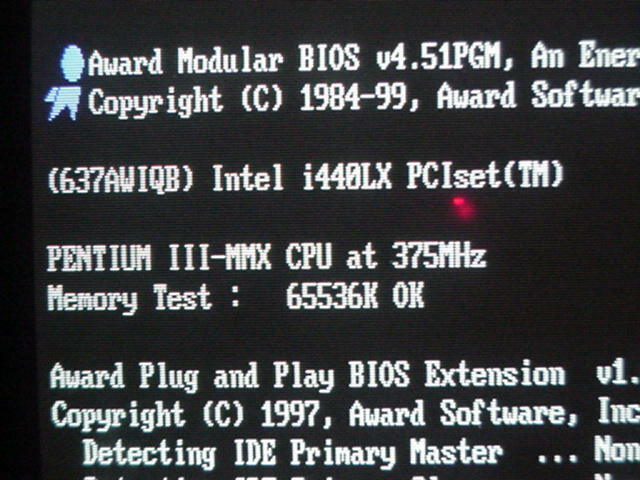 the BIOS hasn't been upgraded since 1997!". The latest BIOS over at Shuttle's site is dated November of 2000 so I'm hoping it enables coppermine support. But I'm not sure which revision of the board I have. I'm waiting on Shuttle tech support, who I emailed the serial number to, to get back with me on what BIOS to use. With any luck I will get this up and running, and at an amazing 75MHz FSB too! Maybe even 83MHz if I hack the linear VIO regulator! I'll probably hack the Vcore regulator for less voltage, so I can passively cool the CPU with a Glaciator heatsink. Might even spend $50 on a Celly 766 if I get this going . . .
Just waiting on Shuttle to get back with me . . .
ooooo, I hate 'dem LX boards. No 1/3 divider. I could only overclock mine to 73 FSB. 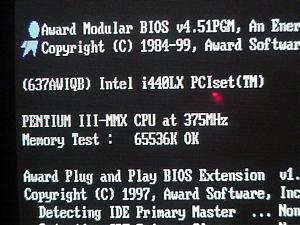 I don't think mobo makers would bother with a bios update for coppermines on an LX board, but I'll keep my fingers crossed. A friend had a old BX Shuttle board, and THAT did NOT have CUmine support (I tried flashing). Really pissed me off too. I was all set to give hime a 566celery (oc'd to 850) and a slotket. I hope you have better luck. If it doesn't work, that P2-333 should probably handle 375 easy. Also, for folding purposes, the full speed cache doesn't seem to help. Assuming MHz neutral, P2 = P3 = All Celerons. A friend had a old BX Shuttle board, and THAT did NOT have CUmine support (I tried flashing). Technically the HIP6004A voltage regulator doesn't support coppermine CPUs, but having the ability to post seems to indicate otherwise. I could always swap the HIP6004A for a pin compatible HIP6004B which does fully support coppermines. The big concern in my case is things on the BIOS front, as I don't have the time to teach myself how to rewrite the BIOS for coppermine support. If it doesn't work, that P2-333 should probably handle 375 easy. Actually the P2-333 is strangely not multiplier locked. Looking at your picture just made me remember. When I installed the 566 + slotket, it wouldn't boot. So I changed the pins on the slotket to FSB = 100, voltage =1.9 (I think). 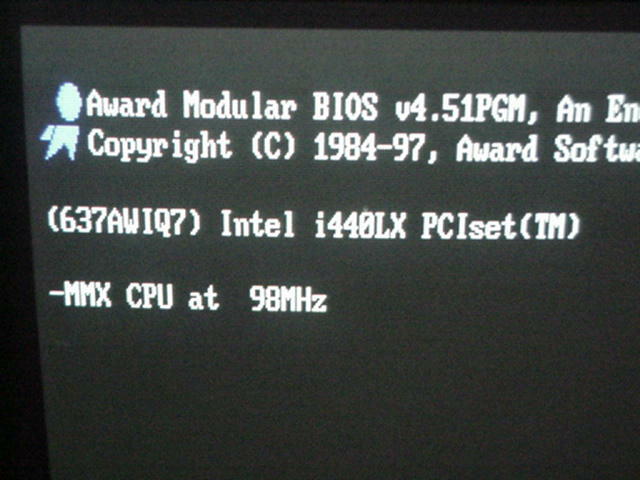 I managed to get it to boot, but the screen said the CPU was running at like 95 mhz. I had already updated to the latest bios, so I was out of options. I hope you succeed where I failed. Regarding multipliers, both my LX and my friend's BX did not have multiplier control.. I wish I could have checked for a multiplier lock. Don't you just love the sweet smell of success! What was it, a bios update? Yup a BIOS flash did it. Shuttle never got back with me. 2. change setup item "Numlock status" setup default to "On"
3. change setup item "Resume by Ring" default to "Enabled"
5. add item "Report NO FDD for Win95"
2. add item "Init Display First"
6. POST message "copyright(c) 1984-98" change to "copyright(c) 1984-99"
4. item "CPU Speed (W/HClk= 66Mhz) add select "Lock"
I'm starting to think... maybe I should give that old board another look see. It's sitting under his bed. I upgraded him to a duron a while back. It stil has his old P2-333 cpu. I think I smell another folding box, or at least another project. But first I want to see if I can get the voltage down a bit. I think pushing some voltage from the 5V PSU rail through a resistor and to the regulators voltage feed back pin will do the trick, but I'm gonna E-mail a friend first and see what he thinks. I'm thinking an inductor and possibly a ceramic capacitor might be needed to get the 5V rail nice and stable before I can use it. I'm also gonna check around for the VIO regulator's spec sheet, I think the LX is gonna want a bit extra voltage even at 75MHz. Which shows me the jumper setting for up to 7.5X! But more interestingly, it states that the board supports PPGA Celeron 533s which use an 8X multiplier, so I'm thinking the 11.5X multiplier of the Celly 766 will work. That's sweet. 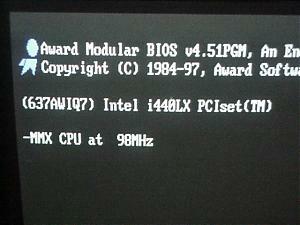 I would think that since my b-in-laws mobo is Shuttle BX, it should have similiar upgradability. Sounds like it's worth a shot. Seems that the PPGA is the upper limit for the board tho. There's no mention anywhere of FCPGA. Still that's pretty good upgradibility for an old LX board. Let me know how it goes. My friend got back with me on hacking the for less Vcc. Apparently I can put some more juice the the regulators Vfb pin "but [it] tends to place a large load on it." So I think I will just have to live with 1.8V, a Celly 766 will probably need that to run at 955MHz anyway. The MOSFETs will probably be loaded well beyond there designed tolerances with a CPU at that speed. So it may be neccessary to put a heatsink on them, and maybe even replace them. I found the spec sheet for the linear voltage regulator I thought was for VIO or memory power or chipset power. I hooked my multimeter up and it seems to only be putting out 1.5V I'm not sure what that little bugger is for now, but as it is a 5A part it must be something fairly power consumptive(that's a word right?). Again, I'm waiting for a friend to get back with me on his thoughts. Last edited by dimmreaper; 26th February, 2002 at 10:03 PM. I just tried the board at 83MHz FSB and it was a no go. Hope I can manage to get some more juice to the chipset and getting it cranking. Legacy overclocking is turning out to be as fun as overclocking with the cutting edge stuff, who'd've thunk it . . . .
...and a lot less painful if you pull an "oops"
I'm still not sure what the linear regulator the puts out 1.5V is for, but I just hacked it for 10% more voltage anyway.